First off, I want to take a second to introduce you to an exciting opportunity that I think soooo many of you will adore. You may remember me speaking at last year’s Food Entrepreneur Summit, a virtual “conference” of foodie entrepreneurs, bloggers, and biz owners speaking about how to transform your blog into a serious business. Well, this year’s Summit is coming up around the corner on January 2nd! Discussions will include keys to success, work life balance, email marketing, taking great photos, beating blogger burnout, finding your niche, sponsored posts, growth and monetization strategies, content creation, and so much more. You know how fired up I get about inspiring you all to embrace your passions! Before the Summit even begins, there’s a rad online Planning Party happening on December 12th through the 17th to help you get organized and set serious goals for 2017. Sometimes you just need to sit down and actually write down what you want. I’ll be right there with you, so be sure to sign up! Again, the Planning Party is totally free. Onto the eats! 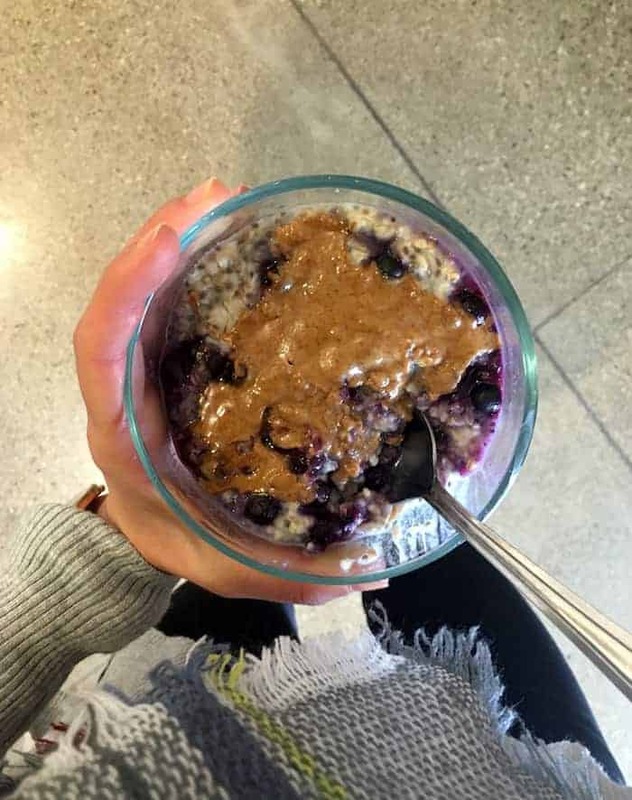 Breakfast was my standard overnight steel-cut oats (see this post for cooking instructions) with chia seeds, Wild Blueberries and almond butter. Once the oats are cooked in the morning, I portion them into my little glass Tupperware and top with bloobs so it’s microwave-ready in the a.m. I also had plenty of coffee! 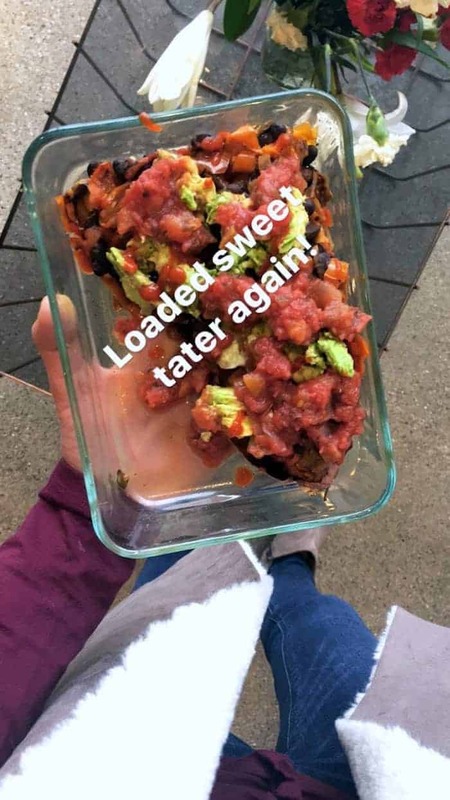 Lunch was a new staple with a pic taken straight from my insta story…introducing loaded sweet potatoes (kind of similar to this recipe)! I started off by sautéing a can of organic spicy black beans with cumin, chili powder, and nutritional yeast. While those simmered, I sautéed peppers, onion, jalapeño, and garlic. I stored everything (including a few baked sweet potatoes) in separate Tupperware and assembled in the morning. Toppings galore included salsa, hot sauce, and avocado added right before serving. Sounds like a lot of prep work, but it didn’t take long at all and I LOVED having this for lunches. So many fabulous flavors and textures! P.S. I got some questions about my outfit, so I thought I’d go ahead and link to my favorite pair of jeans, my go-to booties, and the vest I’ve been wearing like every day (that’s under $20!). If you know me at all you know that I pretty much never wear jeans because I find them so uncomfortable, so this pair is like gold to me. They have a super cute and flattering fit, they don’t stretch out during the day (dream), and they have that perfect distressed look. The booties are super comfy and go with pretty much everything. 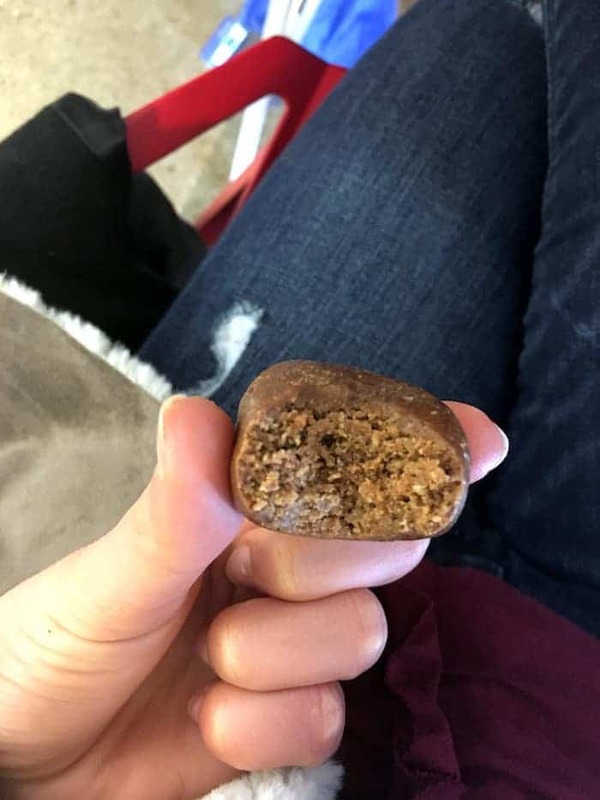 Snacks included a gingerbread no-bake bite that’s coming soon to Alchemy (similar to this recipe but not exactly), aa peppermint chocolate baked oatmeal cup (modified version of these Chocolate Peanut Butter Baked Oatmeal Cups), and an apple. Before din I took a swig of this lovely gut shot from my friends at Farmhouse Culture. It basically tastes like extra yummy pickle juice. The hanger monster was in full swing so I had a little appetizer before the boyf got home from work—creamy buffalo chickpea cauliflower soup! The recipe isn’t perfected yet but I’ll share it as soon as it is. Dinner was this Easy Vegan Lasagna (seriously my favorite blog recipe ever) with roasted broccoli and salad. I used these Explore Cuisine lentil lasagna noodles which I was a bit skeptical of but they actually turned out amazing. I’m definitely buying these again! I couldn’t resist a couple Ginger Snaps with almond milk before bed. They’re officially gone which means it’s officially time for another batch! 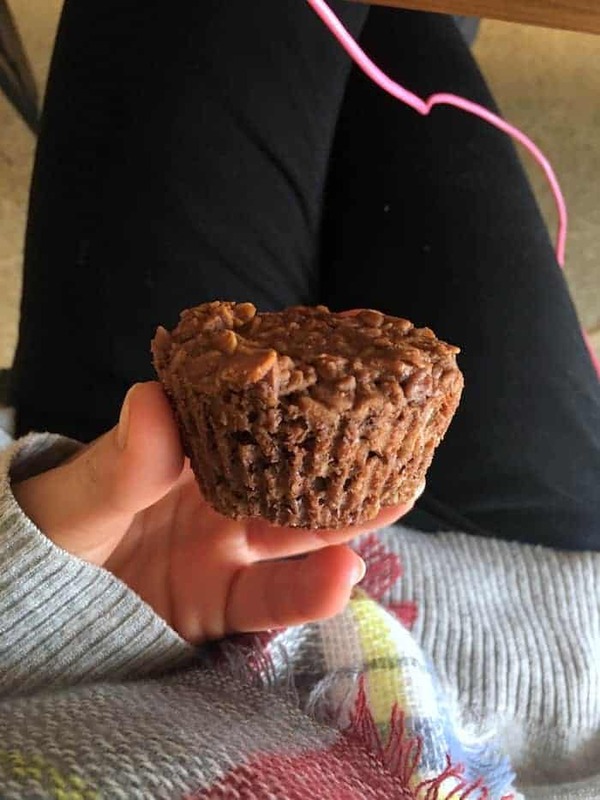 Lastly, if you’re ever feeling like perusing past What I Ate Wednesday posts, they’re all archived under the Nutrition tab. Check out previous posts here! I love seeing your creations! Let me know how you liked my recipes in the comments below or snap a pic on Instagram with the hashtag #hummusapien! I love to re-post my favorites. You can also upload them to the Hummusapien Facebook page! Love you. It was awesome checking out Alchemy briefly this past weekend- thanks for the recs… that pesto avocado toast was amaaaaazing! I’m in the planning party right now too – Nicole is awesome. I’m excited for that chickpea cauliflower soup recipe! I just got an Instant Pot (yay cyber Monday!) and so far have made steel cut oats and quinoa. What do you consider a serving size of cooked steel cut oats? I would say a 1 or 1 1/4 Cup! Ohmygoodness, I’ve never found a fellow jean-hater! Everyone’s always like, “let me change into something more comfortable” and then they come back in jeans, and I’m like, “Ew. Gross.” Not out loud of course. Anyway, maybe I’ll have to look into the jeans in the link! Why have I never made your lasagna? Every time I see it I’m so envious. I love taco style sweet potatoes- that’s a common week night meal at my house! That gut shot looks so good..anything that tastes like pickles is a winner! !